Key Difference: A diode is a type of electrical device that allows current to move through it in only one direction. It consists of an N-type semiconductor and a P-type semiconductor that are placed together. A capacitor consists of two conductors which are separated by a dielectric medium. It stores electrical charge and is capable of discharging it whenever required. A diode is a lossy passive electronic component, whereas a capacitor is a non-lossy passive electronic component. 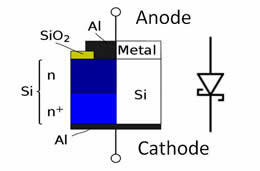 A Schottky diode - a semiconductor metal junction is formed between a semiconductor and a metal, thus creating a Schottky barrier. Diodes are often used for rectifying an Alternating Current voltage to a Direct Current voltage. There are various types of diodes. A capacitor is an electronic component that stores energy in the form of an electric field. It is constructed by using closely spaced conductors. In functioning, it acts quite similar to small rechargeable batteries. Therefore, it is able to store and release electrical energy. Originally, capacitors were known as condensers. It is an electronic component that stores electrical charge and is capable of discharging it whenever required. Capacitance defines the capacity of a capacitor to store electrons. Capacitance is measured in Farads. A capacitor blocks Direct Current (DC) and allows Alternating Current (AC) to pass through it. Therefore, they are widely used to extract AC components from DC + AC components. A capacitor is generally constructed by using two metal plates or metal foils separated by an insulator called a dielectric material. This insulator prevents charges to move across the plates. Any non-conducting substance can be used as a dielectric material. In the existence of voltage, one end of the capacitor drains, whereas the other end fills with charge. The process is termed as charging. Due to this imbalance, a reverse voltage develops that stops the capacitor from being charged. Capacitors are capable of storing electrical energy directly as an electrostatic field is created between two metal "plates". Thus, a capacitor can be defined as an arrangement of two conducting surfaces separated by a dielectric medium. Capacitors can be checked with an ohmmeter for short or open circuits. A diode is a type of electrical device that allows the current to move through it in only one direction. Capacitors are capable of storing electrical energy directly as an electrostatic field is created between two metal "plates". A capacitor is generally constructed using two metal plates or metal foils separated by an insulator called a dielectric material. Sub−miniature Multi layer ceramic chip (surface mount) capacitor. Relatively high capacitance for size is achieved by multiple layers. Electrolytic capacitors - They resemble small cylinders and range in value from 1 µF to several Farads. Ceramic capacitors - They are quite smaller in size and value, ranging from a few Pico Farads to 1 µF. Tantalum capacitors – They are quite similar in size to ceramic. However, they can hold more charge, up to several hundred µF. They tend to be accurate and stable. An N-type semiconductor and a P-type semiconductor that are placed together. Thin metal sheets held very close together but separated by an insulator. A horizontal line with an arrow pointing to an intersecting vertical line. Two parallel lines (either flat or curved); The lines must be placed close enough. However, they must not touch each other. From Gk. di- "twice" + hodos "way"
1926, from capacity with Latinate agent-noun ending.